There is probably no house or road or bridge or port in South Asia whose builders can claim to have built it with legally obtained sand alone. Illegal mining of sand from riverbeds is so ubiquitous in the subcontinent that on the rare occasions it is stopped temporarily by a judicial order, house prices go up and editorials criticising the judgement are written in financial newspapers. Reporting illegal sand mining is one of the most dangerous things a journalist can do in India. In the last couple of years, three journalists have been killed, allegedly by the illegal sand mining mafia, one each in the states of Uttar Pradesh, Madhya Pradesh and Bihar. A fourth journalist reporting on illegal mining of sand from the beaches of Tamil Nadu has been repeatedly threatened; anonymous callers — claiming to speak on behalf of a local politician from the party that rules the state — have ordered her to stay away from the area or else. The effects are there for all to see. Riverbank erosion has increased, to the point that one of the bridges over the Ganga has become unusable — a girder collapsed because so much sand and silt were removed around its foundations — and residents now have to take a slow ferry or a 50 kilometre detour to cross the river. Sand mining and gravel extraction picks up every winter, when the water flow is low, and it is easier to mine the sand from the exposed riverbed. Nowadays, it is no longer a matter of only using manual shovels and spades. Mechanised shovels and donkeys with tractors are often used to tear apart the riverbed. Unfortunately the government remains indifferent, perhaps because it does not impact their vote bank. Most people are not aware about the issue and even the communities living near the riverbed usually don’t create a ruckus. Therefore there no state policy or planning to control the indiscriminate excavation of the riverbeds by identifying and designating areas from where the miners can quarry the building material. That is causing a colossal ecological problem. People along such exploited rivers who rely on wells often complain not just of a drop in the water levels with many wells running dry, but of water quality degradation. However, the residents do not realise sand mining is one of the main reasons. The sand acts as a filter before the water percolates into the ground, and so without the sand, water will just rush down to become flash floods downstream. The impact of sand mining may be less downstream in the plains, as river ecology evolves with the change in slope. However, less sediment flowing down the rivers does result in erosion of the banks and loss of fertility in irrigated areas and delta regions. 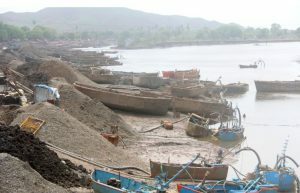 Trapping of sediment in the Mangla reservoir on the Jhelum, for example, has reduced fish species downstream of the dam. Clearer waters mean the predators have a field day eating the young of other fish. Various state governments in India and national governments in other South Asian countries have such stretches where extraction of sand and gravel from the riverbed is permitted and licensed. But this system has not kept pace with the demand for construction material, and that needs to be sorted out immediately. Sri Lanka, last year passed a law to regulate and have a proper mechanism to mine sand, gravel, and rocks — a law that can serve as a model for other countries in the region. On September 10, Judges N M Jamdar and Prithviraj Chavan passed the following order on a petition by the Federation of Rainbow Warriors, represented by their advocate Nigel Da Costa Frias. The order deplores the lax attitude of the government and administration. This Petition pertains to sand mining in the State of Goa. A grievance, interalia, is made regarding lack of regulatory mechanism to prevent illegal sand mining in the State. “Leave to add ‘Goa State Biodiversity Board’ as a party respondent. Amendment to be carried out forthwith. 2. In the order dated 3 July 2018, we had crystallized certain points on which State response was called for. Memorandum dated 24 December 2013 and if so, within how much time this plan would be prepared? If it is not required, whether the State is ready to prepare one? (b) Whether any study is mandated to determine the depth of the river beds and the impact of sand mining activities on the river beds, the buffer zones, proximity to bridges, embankment, bunds and river banks and stream, is mandated under the Memorandum dated 24 December 2013 and even if it is not so mandated, whether the State is ready to undertake such study and if so, within how much time? (c) Whether periodical monitoring by the Goa State Bio-Diversity Board as regarding to ecological impacts of sand extraction on the riverine ecosystem is being carried out. If so, whether there are any reports prepared of the said monitoring and which is the Authority which enforces the compliances? (d) Whether there is any Authority is entrusted with the compliance of the conditions environment clearance in respect of the sand mining or the general activity of sand mining, and whether any progress reports are maintained by such Authority? (e) Whether any patrolling is being carried out to oversee the activity of the sand mining? 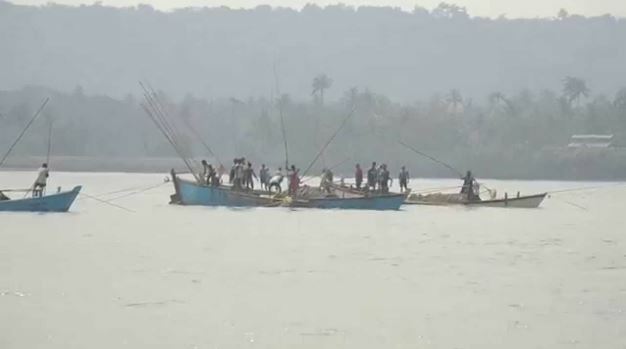 (f) Whether any registration and inspection of of boats involved in sand mining, methods used for extraction and monitoring of personnel involvement of boats used for sand mining is being carried out, if so, details thereof? October 2017, 30 October 2017 and 22 November 2017. In one of the cases penalty has been imposed, some of the cases have been compounded and in some cases notices have been issued. The trend appears to be of compounding the cases. This approach can hardly have any deterrent effect. There must be serious action if the violations are proved. Mere compounding will simply embolden further violations. 4. It is stated in the affidavit that environmental clearances have already been granted by the Goa State Environment Impact Assessment Authority. It is stated that regular inspections are being carried out and offenders are being penalized. To say the least, affidavit in reply, which has only general answers does not address the various questions as we have crystallized above, with details. 5. The first question we had posed to the State was preparation of plan with a study in respect of sustainable sand mining. Learned Counsel for the petitioner has placed before us the Sustainable Sand Mining Guide Lines issued by the Ministry of Environment and Forest. The Guide Lines stress that the sand mining be carried out in a sustainable manner while protecting natural environment and ensuring restoration of the ecological system. These objectives cannot be achieved unless there is an In-Depth study and preparation of plan. What is pointed out is the permission granted by the Goa State Environment Impact Assessment Authority. If a comprehensive plan is prepared and study is undertaken there will be clarity on the issue. In the affidavit in reply filed by the Director it is admitted that a study needs to be carried out. Flying squad and complaint/monitoring mechanism, comprising of senior level representatives from stakeholder Departments and Authorities to be constituted for effective implementation. There should also be a mechanism for redressal of complaints at District level and a dedicated helpline number. The Goa State Biodiversity Board should periodically monitor riverine and riparian biodiversity on a sampling mode. These are the conditions on which the Collector has been authorized to give further licenses and therefore they will have to be strictly complied with. 7. As regard the flying squad, the affidavit of the Director does not disclose that it has been constituted. Learned Counsel for the petitioner on instructions states that flying squad does not have a functional Boat. 8. The permits which have been granted to the individuals also lay down various conditions. The permit holder is under obligation not to interfere or damage any riverbanks or not to carry out excavation below maximum depth specified. So that the permit holder carries out the obligation under the permission, a regular monitoring is required. It is for the very reason that the establishment of the flying squad is necessary and must be made effective. 9. In both, implementation of the conditions and preparation of plan and conducting an In-Depth study more efforts on the part of the State are necessary. The conditions in the EC and the permits will have to be enforced. 10. Accordingly, as a first step, we direct that a flying squad, if not already set up, be set up within a period of six weeks from today. A flying squad should have a functional boat for its effective monitoring. 11. The learned Counsel for the petitioner has also drawn our attention to the memorandum issued by the Ministry of Environment and Forest on 24 December 2013 more particularly clause 2(1)(iii)(e) in respect of the study for annual replenishment of sand. It is pointed out that for carrying out this study, the monsoon period, when the sand mining activity is suspended, could be most ideal. 12. The Captain of Ports along with the Goa State Environment Impact Assessment Authority and a Biodiversity Board will consider carrying out a preliminary study as contemplated in the Office Memorandum dated 24 December 2013. Since it will be a preliminary study, the same can be conducted as early as possible preferably within a period of four weeks from today, unless of course it is not possible due to some cogent reason or that scientifically it is not the correct time period. 13. As already contemplated in the Environment Clearances, the State will constitute a committee comprising of senior level representative from stake holders department for effective implementation and monitoring of the general and specific conditions of the environment clearance vis-a-vis complaints at the district level, within a period of eight weeks. 14. The State will set up a dedicated helpline number, if not already set up, for effective redressal of the complaint and will give adequate wide publicity of the dedicated helpline number. 15. The State will set up a study group of expert on the subject to prepare In-Depth study of the aspect of sustainable sand mining and map as contemplated under the sustainable sand mining guidelines and environmental clearances granted by the Goa State Environment Impact Assessment Authority. The composition of the study group shall be identified within a period of six weeks from today and the composition of the same shall be placed before us before it is so finally constituted. 16. To report the compliance of the above directions and to ascertain further progress in the matter, we defer the hearing of this petition by six weeks from today. 3. The fact that there are various instances of illegal sand mining is acknowledged by the State. According to the State Authorities, they are making efforts to control such violations. 4. To control the illegal sand mining, there must be an effective enforcement mechanism in place. Instead we see a complete lack of any sort of effective regulatory mechanism. The Petition was heard in the morning session and was kept in the afternoon session for the learned Additional Govt. Advocate to take instructions as we were given the standard explanation of movement of files from table to table. Now the Director Mines is present in the Court along with the Deputy Captain of Ports. We are informed by the learned Additional Govt. Advocate, on instructions, that the enforcement squad was created for Pernem, Bardez, Tiswadi, Bicholim, Sattari and Ponda Talukas on 22 August 2013, but it is non-functional. There is no functional boat. It is obvious that the State will not be able to curb the illegal sand mining if it does not have an enforcement mechanism in the form of Patrolling Squad. The State also has not set any help line or a complaint platform to receive any information regarding illegal sand mining. In such a state of affairs, how it will deter illegal sand mining is difficult to discern. 5. It is absolutely necessary that the State must put in place a regulatory mechanism to curb the illegal sand mining. In our earlier order, reproduced above with underlined emphasis, we have referred to various conditions and stipulations imposed by the authorities themselves. The conditions seems to have remained on paper. 6. The learned Additional Govt. Advocate states that the Director of Mines & Geology is in process of creating the enforcement squads. He states that squads with same compositions as in communication dated 22 August 2013 will be set up. He states that a communication to that effect will be issued by tomorrow. Learned Additional Govt. Advocate states that the Director of Mines and Geology has requested the Captain of Ports and the Coastal Security Police, to provide services of functional boats. This letter is sent today, even though we had granted six weeks time. The Captain of Ports and the Coastal Security Police shall accordingly provide the functional boats as requested by the Director of Mines and Geology. All the three Authorities will report compliance by next date. We are informed that the sand mining season would commence from 1 October 2018. We expect that the regulatory mechanism in the form of enforcement squad with functional boats and complaint forum is established forthwith, to avoid any restraint order. 7. S.O. to 12 September 2018. To be listed under the caption “For Directions”. On the next date, the Respondents will apprise the Court of the status of the progress in respect of the other directions issued.